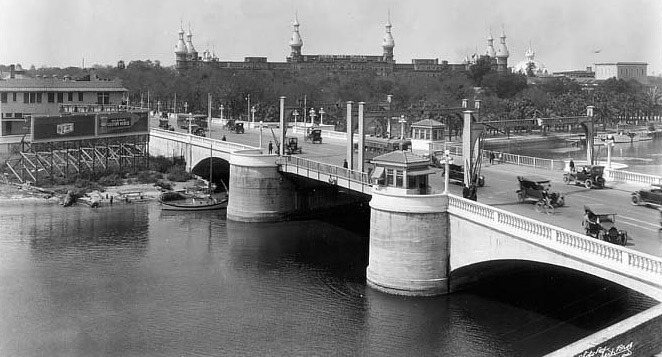 By the turn of the century, nearly 16,000 people called Tampa home, and the Lafayette Street Bridge did not meet the needs of such a rapidly growing city. 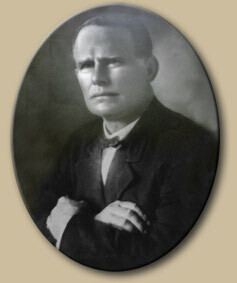 William Frecker had been successful in his quest for mayor in 1906, defeating Frank Bowyer and Arthur Cuscaden, a businessman who had served on the City Council during the McKay administration. A new bridge over the river at Lafayette Street was to be paid for by these bonds. 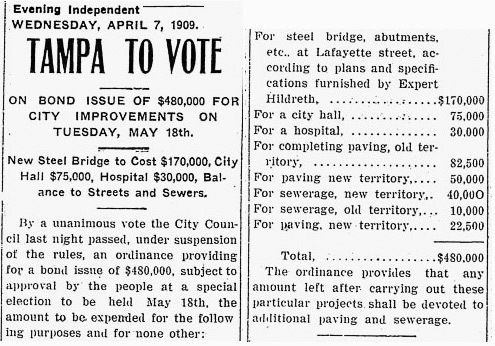 In November 1907 the city council passed an ordinance approving bonds (subject to voter approval) to pay for a new Lafayette Street Bridge, curbing and paving, sewers, a city hospital, a city stockade, and to pay the remaining debt from construction of the city’s crematory (trash incinerator). Looking west along Lafayette Street from Franklin Street, 1906. A bond election was set for January 1908, but in December 1907, the city cancelled the election and the proposed bonds in reaction to a nationwide financial panic. The city council was concerned that due to the crisis, the city would not be able to handle the bond issue financially and that a weak market would yield a low price. Mayor Frecker played a precarious balancing act between opponents and proponents of the bonds, agreeing to postpone the election while reaffirming his support for the bonds. On election day May 18, 1909, turnout was light, with 319 votes for the bonds and 830 against. In no wards were more people for the bonds than against, even in the Third Ward, which included Hyde Park. Tampa voters turned down the municipal bond issue that would have paid for a new Lafayette Street Bridge, a city hall, a city hospital, and other public improvements such as sewers and paved streets. Upon post-election reflection, bond supporters theorized that if the bond issue had been split into separate and smaller specific issues, at least some of it might have passed, although probably not the bridge issue. Some voters were against the bonds because they disliked the city administration, but the main reason the bond issue was defeated was the bridge itself. Many people thought that the $170,000 requested for a new bridge at Lafayette Street was just too expensive. Additionally, people wanted to know how much money the streetcar companies were willing to contribute and how much of the cost would be borne by taxpayers, but the answers were not forthcoming. As late as one week before the election, city councilmen met with the Tampa Electric and the Tampa & Sulphur Springs Traction companies trying to secure a written commitment. 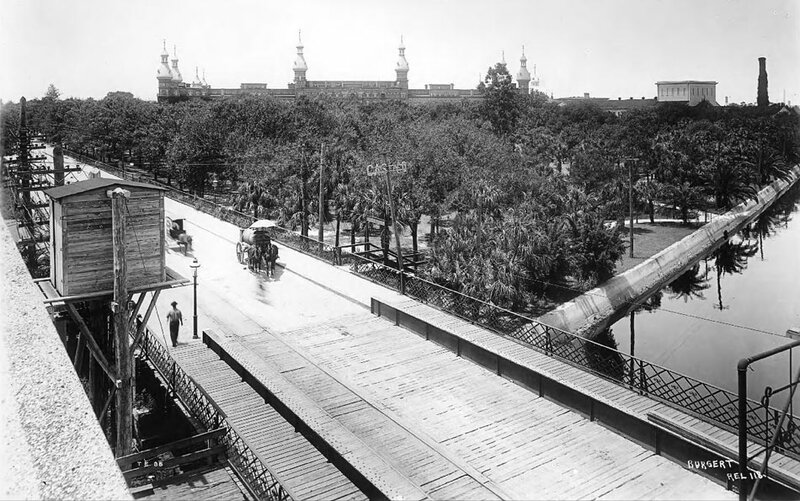 Eventually the Tampa & Sulphur Springs Traction Company agreed to pay $20,000 for the right to cross the bridge with its rails and cars; however, Tampa Electric declined to make an offer. 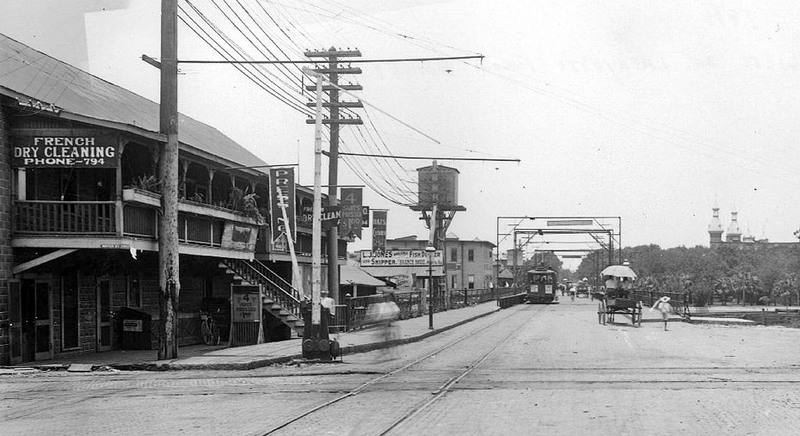 By the end of the week of August 15, 1906, the Tampa Electric street cars were running from the farthest end of West Tampa to Twenty-Second Street in Ybor City. The Tampa & Sulphur Springs Traction Company, who was competing with Tampa Electric Co., used a different route from West Tampa to Ybor. 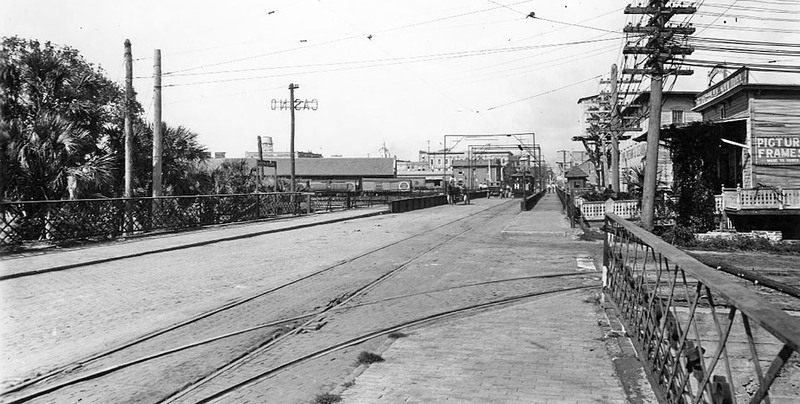 At the northern extremity of Garcia Avenue, the Tampa and Sulphur Springs Traction Company was building the Ross Avenue Bridge across the Hillsborough River on which the tracks were laid for the direct street car line linking Ybor City and West Tampa. 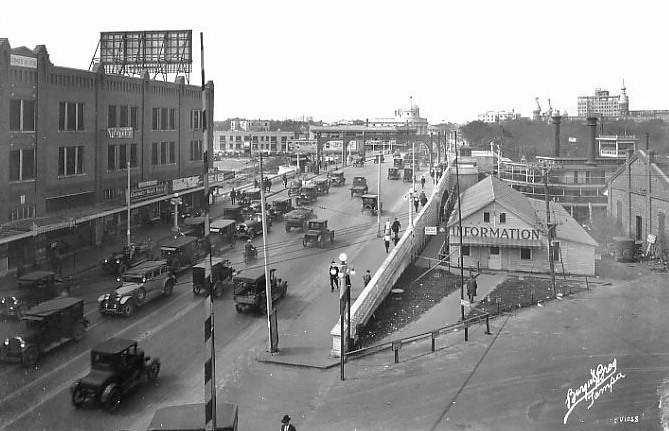 The bridge became known as the Garcia Avenue bridge and was located just east of today's bridge on North Boulevard (the Holtsinger bridge.) Many cigar makers worked in West Tampa and lived in Ybor City and vice versa. 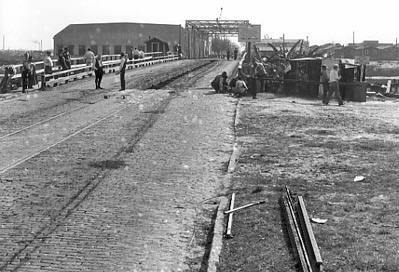 Road surface repaving on the Garcia Ave. bridge, 1934 Garcia Avenue bridge looking towards the east, 1957. In 1959, the Eugene Holtsinger bridge (North Blvd.) was built across the river near the bottom of this photo. In estimating the price of replacing the bridge, the city council expected the two streetcar lines that had expressed interest in using the bridge – Tampa Electric and the Tampa & Sulphur Springs Traction Company – to pay for a considerable portion of the cost, as much as a third. With a preliminary estimate of $165,000, even minus an estimated $50,000 contribution from the streetcar companies, the price tag was too much for some Tampans, including Mayor Francis Lyman Wing. Wing called plans for the new bridge and a proposed city hall building “ridiculously exorbitant,” later clarifying that he believed these to be important projects, but just too expensive as proposed. Continued arguments between those who wanted to replace the entire bridge, and those who thought that the bridge just needed a few repairs, led the city to solicit the opinion of New York consulting engineer J. S. Hildreth. 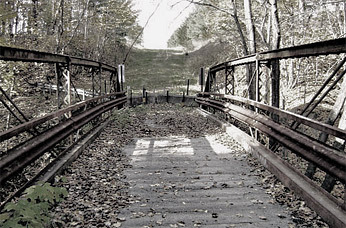 Hildreth’s rather emphatic opinion was that the bridge should be replaced entirely, as the existing bridge was “out of date, too small, too close to the water, and totally inadequate.” Faced with this harsh reality, the council asked Hildreth to make recommendations for the type of bridge that should be erected. Hildreth’s recommendations at this time seem to be the genesis for the form the third bridge ultimately took. 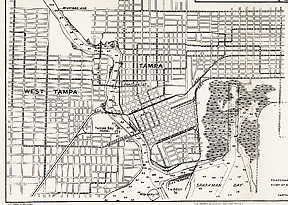 Tampa annexed large areas of Tampa Heights and Hyde Park in 1911, and in May 1911, the state adopted Tampa’s revised city charter. The ward that included Hyde Park had the highest per capita wealth and the next to highest percentage of native white population (83 percent) of all of Tampa wards. 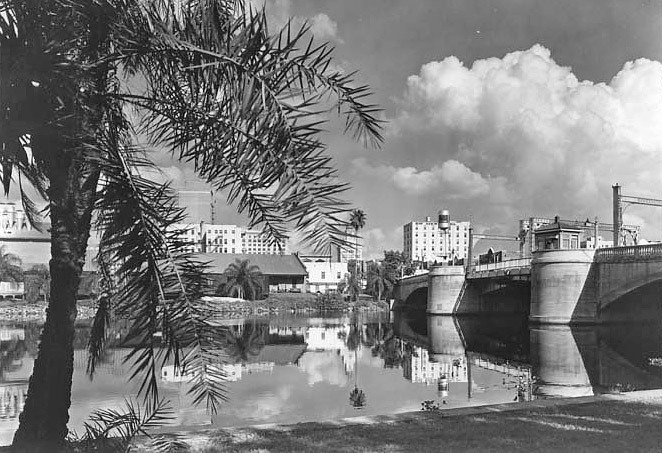 The Tampa city council was stirred to action by Hyde Park’s wealth, social prominence, political power, and rapid growth, returning to the issue of the Lafayette Street Bridge with renewed vigor. 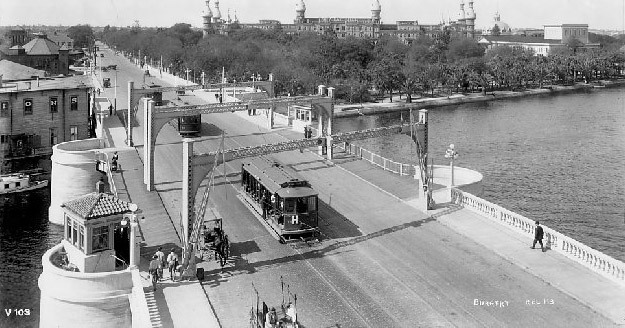 The Tampa Electric Company offered the city $50,000 towards the cost of the bridge, rationalizing that the bridge would not have to be built as strongly if it were not for the streetcar tracks. 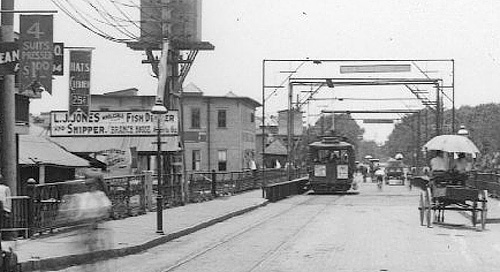 The streetcars were certainly an issue, as the cars would occasionally jump the tracks and stop all bridge traffic, a problem that led the company to impose a three-mile per hour speed limit over the bridge. Also at issue was the question of what right the electric company, a privately owned corporation, had to use the bridge, a publicly owned convenience. Should the city charge rent? Should the electric company pay for bridge maintenance? If the city accepted the money from the company, would it be seen as a concession? The city refused to grant Tampa Electric an exclusive franchise to use streetcar tracks over the Lafayette Street Bridge, and vacillated over whether or not to accept money from the company, concerned that this would negate any ability to ask for bridge rental fees. Mr. McKay also contended that the lesser width bridge would be all that was needed during the life time of the bridge. Mr. Snow then pictured a scene of four large trucks abreast on the driveway at the same time that cars were passing to which the Mayor responded that this was only a possibility and Mr. Snow said yet it might happen to which the former rejoined that it was also possible that one might meet a house moving across the bridge but hardly probable. On September 13, 1911, the city awarded a contract to the Owego Company, for $205,000, to build an eighty-foot-wide bascule lift bridge over the river within one year’s time. After the announcement, the bidding bridge engineers dined at Garcia’s restaurant then enjoyed musical entertainment at the Tampa Yacht and Country Club late into the night. Tampa Yacht & Country Club in 1911, Bayshore at Interbay Blvd. The Owego Bridge Company of Owego, New York was founded in 1892 by Ellery Colby, who had formerly been associated with the Groton Bridge and Manufacturing Company. Two years into business, Owego built the longest single span highway truss bridge in New York, at Mount Morris. As with Groton Bridge, the Owego Bridge Company's main markets were New York and northern Pennsylvania. The company ceased operations in 1917. 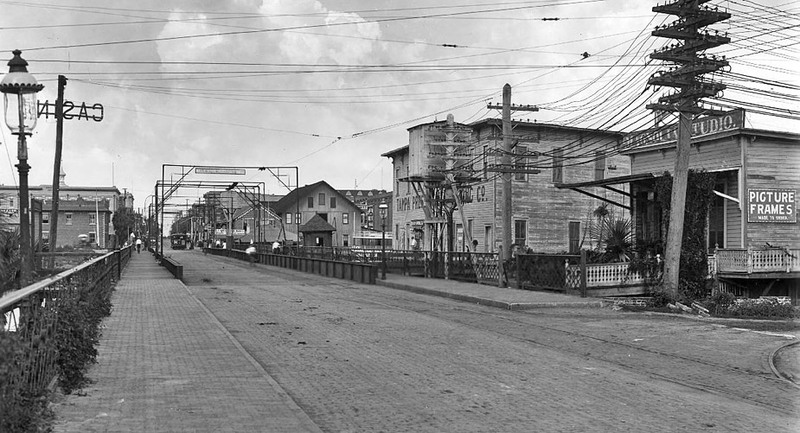 A view of the 2nd Lafayette St. bridge in 1911, looking westward from Ashley St. Such collegiality was short lived, and within just a few weeks, the city received three formal protests of the contract award to Owego. Central to the complaints was the city’s uncertainty as to how the bridge should be built. The city awarded the contract to the high bidder rather than the low bidder, as the advertisement had said it would be. Additionally, Owego’s plan was a skew plan, despite the advertisement’s specifications for a bridge with piers at right angles to the shore. Confusion and concern grew to the point where Mayor McKay refused to sign the contract with the Owego Bridge Company, questioning the legality of the contract. Although McKay’s awareness of the critical need for a new bridge and long-term support for the project were unquestionable, the workers responsible for the bridge’s daily operation reinforced their position by getting the mayor out of bed at six o’clock in the morning to fix the continually malfunctioning bridge. For months, the city wallowed in a contractual quagmire. The mayor, the Board of Public Works, and the prospective contractors could not agree on the legality of the contract, with the mayor refusing to sign, the bridge company wanting the courts to decide the issue, and the board members throwing up their hands claiming ignorance. In the meantime, Tampa prepared to do without the Lafayette Street Bridge, by paving streets between Hyde Park and the Fortune Street Bridge, improvements that would be needed either during bridge construction, or in the all-too-likely event that the old bridge quit working entirely. Photo below: Same view as above, but from the south side of Lafayette St. Notice the sign advertising the Tampa Bay Hotel casino. After several months of legal wrangling, Owego released the city from the contract with the understanding that the Board of Public Works would use Owego’s previously accepted plans as the preferred design for the bridge, and new bids would be solicited only for the actual construction of the bridge, rather than design and construction. 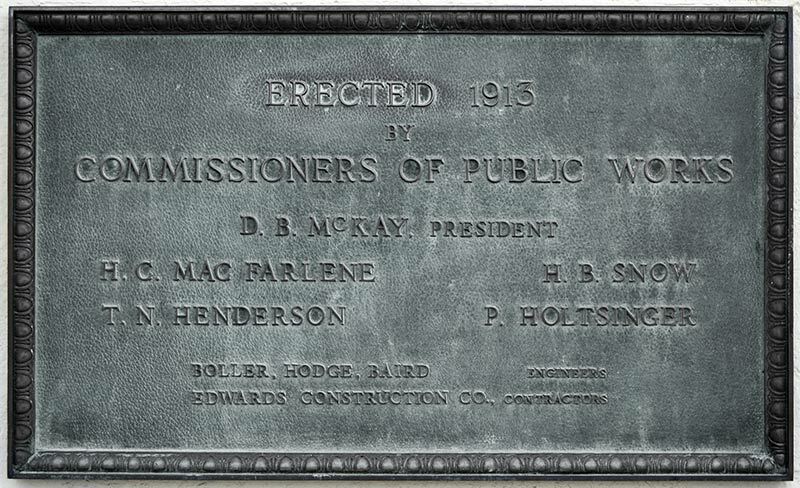 The Owego Bridge Company and other associated companies whose patents were used in the plan would be paid a royalty from whichever contractor was awarded the work. Tampa allowed Owego to bid on the construction contract, but the company was not to be given any special regard. 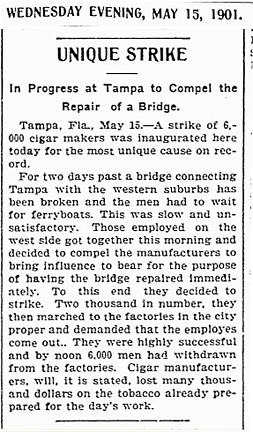 In May 1912, bridge builders from around the country again traveled to Tampa for a bid opening. Four bidders responded, with the local Edwards Construction Company winning the contract. This time, the city delayed the contract award for the simple reason that it did not have the money to pay for the project. The anticipated bridge cost, even with the low bid, was about $240,000, including royalties, engineers’ fees, abutments, and approaches. The bond issue was for $190,000. Simmering resentment about the Owego affair and lingering questions over Tampa Electric’s right to use the bridge further complicated the process. Intriguingly, the electric company’s rejected offer to pay $50,000 toward the cost of construction was now precisely the difference between the bond issue and the projected cost. Tampa Electric claimed to have a perpetual right to cross any bridge the city might build at Lafayette Street, however, and while the council doubted that claim could be upheld in court, it was agreed that the question should be resolved before construction began. The contract letting was delayed to give time to resolve some of these issues; however, public sentiment demanded a new bridge and soon. 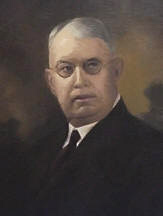 Henry C. Edwards was general manager of the Edwards Construction Company, which he had organized five years earlier. Edwards had lived in Tampa for fourteen years before getting the bridge contract, working in the government engineer’s office before setting out on his own. A native of Wetumpka, Alabama, he fit in well with Tampa’s strongly southern leaders. 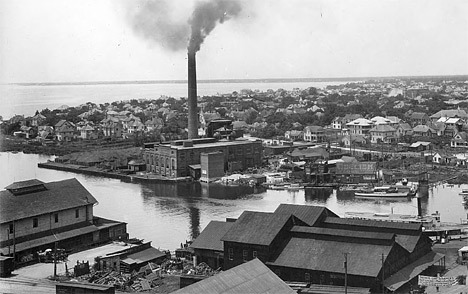 The Edwards Company built many of Tampa’s deep-water terminals, and practically all of the docks from the railroad bridge over the river to the mouth of the river. 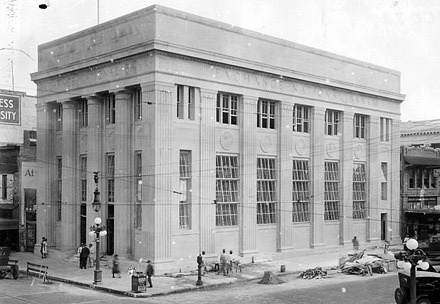 Among other Tampa jobs Edwards completed were Swann-Holtsinger’s Suburb Beautiful seawall, the Garcia Avenue Bridge, concrete bulkheads for the city at Washington and Whiting streets, and bulkheads for Tampa Electric Company. attire for business and pleasure. The design the engineers and councilmen chose for the new bridge was a reinforced concrete arch bridge with a movable span to accommodate river traffic. Reinforced concrete bridges combine the compression strength of concrete and the tensile strength of steel. Benefits included reduced maintenance costs and use of locally available materials. Since this type of bridge construction did not require highly skilled laborers, local workers could be employed. A less measurable benefit was the improved aesthetics of a concrete arch compared to a steel truss; however, this was important given the bridge’s location in the heart of Tampa, in plain view of the central business district and the Tampa Bay Hotel. Steamboats docked at the foot of the bridge, so the structure was many visitors’ first impression of the city. Whereas the 1896 bridge was only seven feet above the low water level, the new bridge was to be 16 feet above low water, theoretically resulting in a 66 percent reduction in the number of times the draw bridge would need to open. The center opening was to be 70 feet wide, compared to 54 feet on the old bridge. Some alignment changes were necessary for Lafayette Street on the west side of the river, near the Tampa Bay Park, and a row of trees was removed. The change in clearance required a three percent grade from the Atlantic Coastline Railroad tracks to the center of the bridge, and changes in the approaches. The L. J. Jones Building on the east side of the river was now in the line of the bridge, and had to be demolished. Delays began as soon as the bridge contract was awarded. Did the city have the right to spend more than the $190,000 bonds approved by the state legislature? Tucker Savage lent his name to a suit (brought with the consent of city officials) intended to clear up the dispute over the money contributed by Tampa Electric, an effort to save trouble later. A native of Virginia, Savage came to Tampa in 1889. 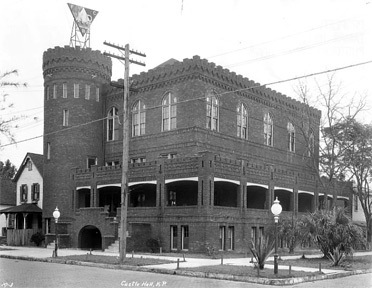 He was an accountant who held several public offices including Tampa fire chief and chief of the sanitary department and was the state’s railroad commissioner during Governor Carlton’s term. Savage owned real estate in Hillsborough County, and was a member of the Tampa Elks. Newspaper reporters repeatedly reminded their readers that Savage’s suit was a friendly one. On May 16, 1912, Judge Robles denied Savage’s petition to keep the City of Tampa from executing the contract for bridge construction. Judge Robles’ opinion was that the legislative act that allowed the $190,000 bond issue did not prohibit the city from accepting money from Tampa Electric and that none of the plans to finance the bridge were illegal. The case went to the state Supreme Court, and in early July 1912, the court confirmed Judge Robles’ decree. The Supreme Court found that when the state legislature approved a $190,000 bond issue, the limit applied to the power to issue bonds, not to the cost of the bridge. The court commented: “The contract seems to us to have been carefully drawn, without suggestion of collusion or fraud and to be within the chartered powers of the city of Tampa.” Tampa and Edwards could sign the contract, get the materials, get the bonds, and get to work. On Friday, August 2, 1912, the city received 190 $1,000 bonds, ready to be signed by Mayor D. B. McKay, City Auditor John Hanbrough, and City Clerk W.A. Johnson. Once signed, the bonds were ready to sell. Tampa was to buy $75,000 of the issue, and save the five percent interest. The remaining bonds were to be sold. The bonds would pay five percent interest per year, and the city expected that bankers would buy the bonds. Indeed, the First National and Exchange National banks of Tampa outbid bankers from Chicago, Cincinnati, and New York for the bridge bonds, giving a premium of $3,593.75 for the $115,000 issue. 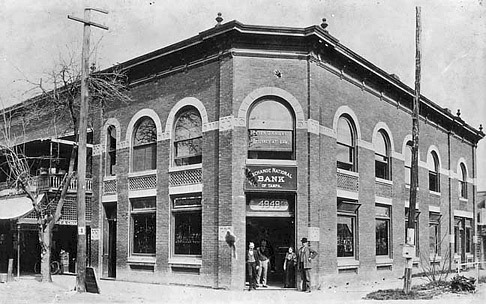 Exchange National Bank, 1895, at Franklin & Twiggs (601 Franklin). 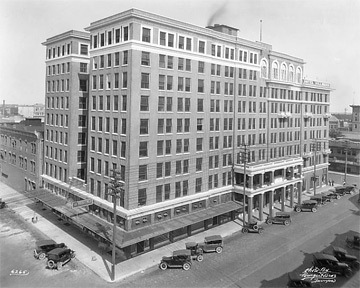 In 1923, their new building was built on the same property and still stands today. This map of Hillsborough River and bay depths from a survey by O. N. Bie in 1910 also indicates all of Tampa's streetcar and rail lines. The bridge contract specified that the contractor would not interrupt travel across the existing bridge for three months after the contract was signed, and that foot travel could proceed across the existing bridge for an additional three months after motorized travel was halted. These time and traffic constraints must have been frustrating to Edwards, as there was a surprising lack of planning about an alternate route across the river. 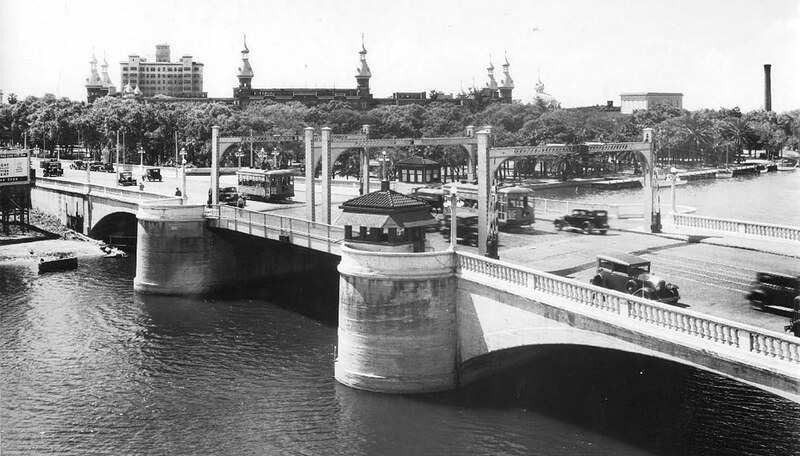 At the request of the Tampa Retail Dealers Association and the Tampa Board of Trade, Mayor McKay asked Edwards to draw up a plan for a temporary bridge over the river at Jackson Street. Edwards also was asked to leave the Lafayette Street Bridge open until the temporary bridge was opened. City councilmen debated at length over countless suggestions for the size and configuration and operation and cost of the temporary bridge. The city called in U.S. Engineer O. N. Bie to give his opinion, as the War Department would have to approve whatever plan was finally chosen. A proposal to just route all traffic over the Fortune Street Bridge met with mostly displeasure. 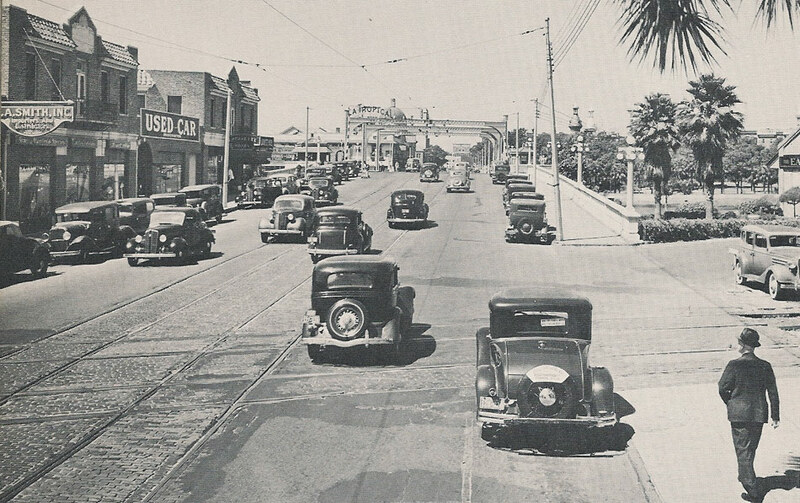 The most common arguments against the detour plan were hardship to downtown merchants and concerns that the Fortune Street Bridge could not handle the added traffic. The mayor worried about the expense, and the possible effect on the city’s millage rate. Some commissioners worried about the safety of a temporary bridge. Councilman Hugh Macfarlane was the most outspoken opponent of the temporary bridge at Jackson Street. 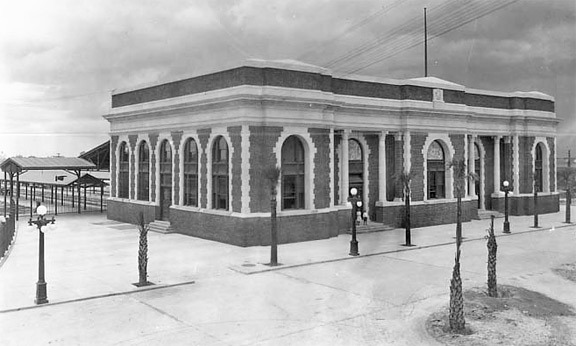 Macfarlane asserted that it was unfair to make taxpayers in Tampa Heights or Ybor City pay for something that was just a convenience to a handful of businessmen: “A bridge used principally for the private convenience of a few businessmen, should be built by those men and they should not ask the city to draw money from all the tax payers for such construction.” Still fresh in Macfarlane’s mind was the fact that he himself had contributed significantly to the privately funded construction of the Fortune Street Bridge, which was subsequently given to the City of Tampa free of charge. However, the Fortune Street Bridge had made the city’s leaders so aware of what could happen if a bridge were to be closed for several months. In May 1901, a barge hit the Fortune Street Bridge, causing so much damage that the bridge was closed for repairs for several months. 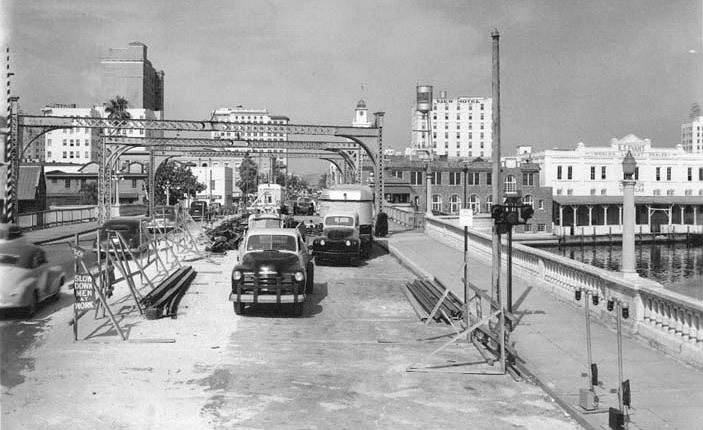 The streetcar line over the bridge was the main connection between West Tampa and Ybor City, and with the bridge closed, the streetcar could not cross at that point. People who lived on one side of the river but worked on the other had to rely on slow ferry service, adding sometimes hours to commute time. Eventually, fed up with the plodding pace of bridge repairs, over one thousand cigar factory workers marched on city hall demanding action. In addition to foreseeable personal inconvenience, anything that caused labor unrest was sure to make a deep and lasting impression on Tampa’s businessmen and councilmen. I understand you are the largest property owner across the river, and that the bulk of your property lies between Lafayette and Fortune streets. You know the value of publicity and advertising; would it not be worth thousands of dollars to you if people were forced to cross the Fortune Street bridge and go through your property to reach the Hyde Park district? Macfarlane fervently denied any potential personal gain from the proposal to use the Fortune Street Bridge, saying that he actually stood to gain more from Jones’ proposal for a temporary bridge, which would help Macfarlane develop his North Hyde Park property. He further identified himself as the largest taxpayer in West Tampa, money that was paying for North Boulevard to be paved in anticipation of the increased traffic over the Fortune Street Bridge while the Lafayette Street Bridge was under construction. Henry Giddens, President of the Retail Dealers Association, apologized to the council for Jones’ comments, but the incident is an intriguing example of the overlapping political and business interests of Tampa’s leaders. Edwards started work on the new Lafayette Street Bridge even while the old bridge stayed opened to all traffic. Workers poured concrete walls, moved telephone cables and electrical wires out of the way, and began driving pilings. By early August, Edwards had forty men working on the bridge, and two times that number later. At the southeast part of the bridge, the pile drivers encountered what was believed to be a Spanish vessel that had “blown up” here 40 or 50 years earlier, along with a bronze cannon. The piles strike the deck or cabin, stand steady for a time under the blows of the pile driver, then suddenly bursting through whatever is holding them back, they go several feet until they again encounter some hard material, which is thought to be the bottom of the boat. After a few more blows the pile goes on, and strikes the bedrock below the ship. Supply shortages and rail car shortages threatened to disrupt progress as well. Concrete suppliers across the country struggled to keep up with a building boom, with the local cost of cement leaping up fifteen to twenty cents a barrel. Fortunately, Edwards had contracts in place for the Lafayette Street Bridge’s concrete, and so was not greatly affected. At some point, however, the Lafayette Street Bridge would have to be completely closed before it could reopen. 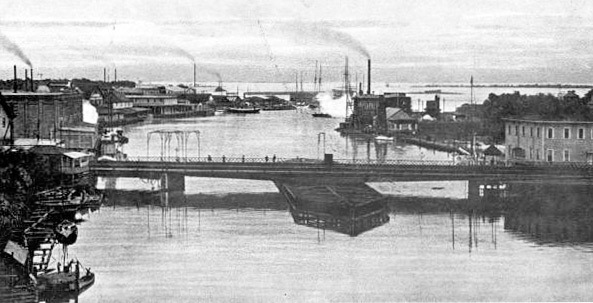 The city’s original plan for traffic crossing the river was to send vehicles over the Fortune Street Bridge, and to use a cable ferry for foot traffic and bicycles at Jackson Street. The Atlantic Coast Line Railroad announced that no pedestrians other than railroad employees would be allowed access to their bridge over the Hillsborough River (at Cass Street.) For years, the public had used a footbridge along the tracks as a shortcut between Tampa and West Tampa, but the railroad, anticipating higher usage, did not want to be liable if someone was injured on their property. City Engineer Warren’s preliminary reports were discouraging. Warren estimated that an adequate temporary bridge would cost $12,000 to $13,000, and take two to three months to complete. In early October of 1912, Captain J. R. Slattery of the U.S. Corps of Engineers recommended a temporary bridge with a seventy-foot-wide opening, adding the caveat that people with navigational interests on the river must agree to the plan. The Tampa Daily Times estimated that a lighter, a type of flat-bottomed boat useful for carrying heavy loads in shallow water, could be rented for five dollars a day. A “high-powered launch” would be needed to operate the lighter, at an additional cost of five dollars a day. Four men would be needed to work full time, two during the day and two during the night. The expenses were starting to add up. Following Captain Slattery’s recommendations, the Tampa city council approved a temporary bridge connecting Jackson and Eagle streets, at an estimated cost of $11,000. Hafford Jones volunteered to gather consent from the affected parties, as requested by Slattery. Hugh Macfarlane voted against the Jackson Street bridge, saying he did not believe it would be safe. Near the end of October, the U.S. 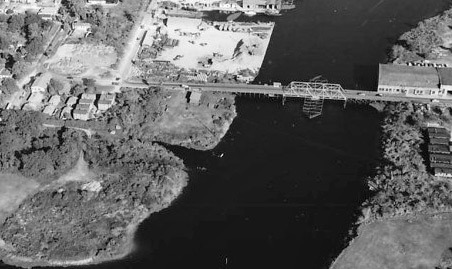 Engineers approved the temporary bridge, and immediately the city council awarded Edwards the contract for its construction. 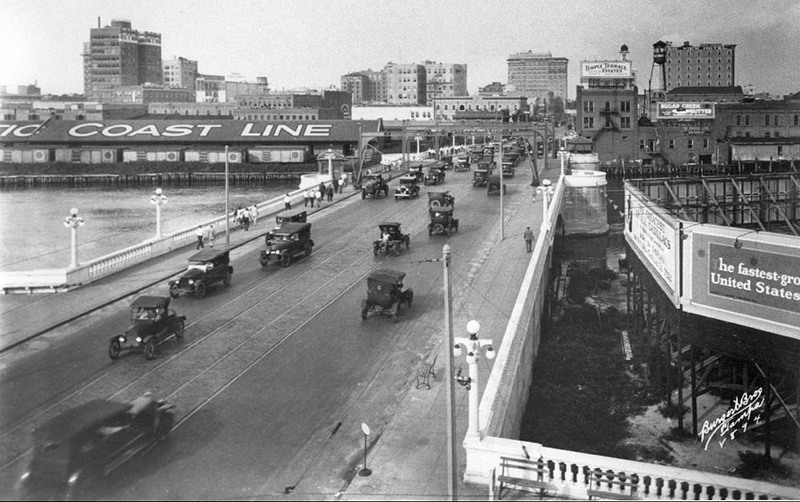 The temporary bridge connecting Jackson and Eagle streets finally opened on December 2, 1912. The lighter (a type of flat-bottomed barge used to transfer goods to and from moored ships) Annis B. acted as the actual moveable span, with temporary aprons connecting the boat to the stationary parts of the bridge. Since the boat was floating, the center span of the bridge rose and fell with the tides. In late December, a southwest wind created a higher than normal tide, and the aprons were at a thirty-degree angle, a steep grade for automobiles. Cars stalled on each side of the bridge, creating a traffic jam until bystanders pushed cars out of the way, making enough room for automobiles to accelerate up and over the hump. The temporary bridge was undoubtedly an inconvenience to motorists and pedestrians, but it also disrupted local business. The Tampa Coal Company told Hyde Park homeowners: “It will be almost impossible after the bridge is closed to deliver your Coal. Give us your order NOW, that we may deliver it before you are cut off.” The streetcar company was arguably the business most inconvenienced by bridge construction, losing a major river crossing. 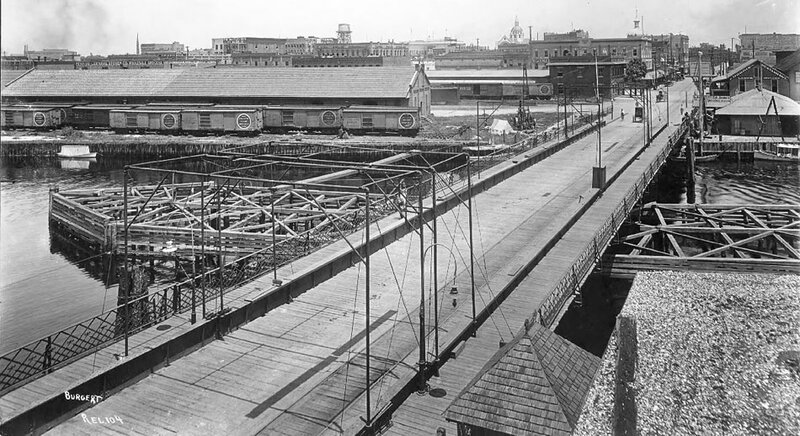 The temporary bridge was too narrow and too slight to accommodate tracks and trolley cars. Tampa Electric, the city council, and local property owners had to agree on an alternate route for a new track. The old line to the power plant went down Parker Street, close to the river; however, the Lafayette Street approach and Parker Street tracks were blocked because Edwards was using those areas for material storage. The electric company took the position that it had the right to lay track on any city street as long as did not cause an obstruction, an opinion not necessarily shared by the city council. The council did, however, give Tampa Electric permission to build the track directly off the Lafayette Street Bridge on Parker Street. Peter O. Knight, acting as council for Tampa Electric, donated $500 to the city to pay for the fill needed at the Parker Street approach. Filling and paving the Parker Street approach was then given priority, so the track could be permanent. The new Lafayette St. bridge, as originally planned, would have particularly inconvenienced property owners along Parker Street, as Parker Street’s intersection with Lafayette would be cut off by the newer, larger bridge. Several property owners banded together and threatened to sue the city, which had the potential to delay the construction project substantially, unless access to Parker Street was incorporated into the bridge. The city council acceded to their demands. 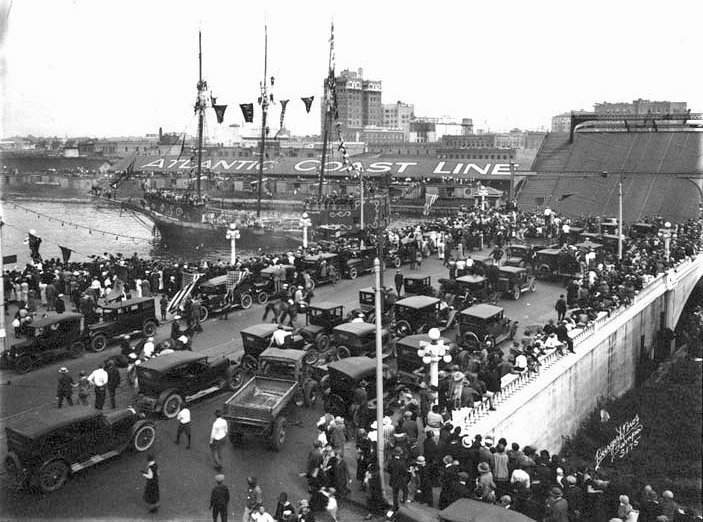 The last day that the old Lafayette Street Bridge was open to vehicle traffic was the day the circus came to town. On October 14, 1912, the Ringling Brothers circus performed on the west bank of the river at the Fairgrounds, and arrangements were made to keep the bridge open to traffic past the contractually specified date so that people could see the show. 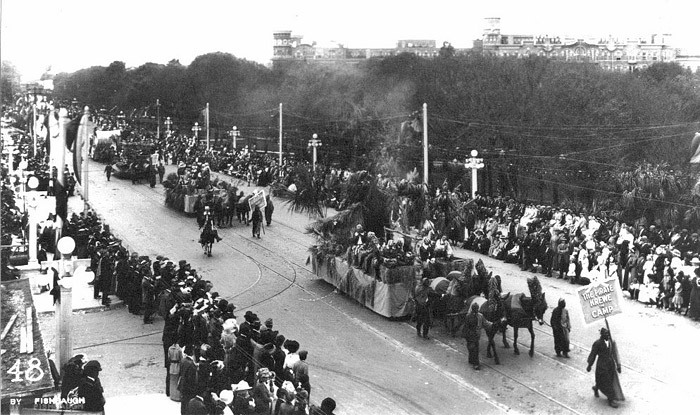 On its final day of full service, the bridge carried heavy loads of cars, bicycles, motorcycles, horse teams, and pedestrians. On February 17, 1913, an expert from the DuPont Powder Mills carefully placed one hundred sticks of dynamite into holes drilled deeply into the old center pier, and literally blew the bridge to bits. The underwater explosion was so quiet that it went almost unnoticed by guests at the Tampa Bay Hotel; however, the blast devastated life in the river. Fishermen scooped boatloads of dazed and dead catfish, mullet, and sheeps head out of the water in just half an hour. The engineers’ plans required concrete piers to be placed directly on bedrock under the river. To do this, the construction company built cofferdams to hold water away from where construction crews would pour concrete into wooden forms. Once the water was out, black men stood on the riverbed, scooping muck into dredges by the shovelful. A hundred-foot tower lifted the cement, and dropped it in “a white, slimy stream” down chutes into the foot frame for the pier. Each of the four concrete piers required a cofferdam, and in February, workers began the second cofferdam. Two weeks ago there was no sound on the new Lafayette street bridge construction but occasional cussing. The engineers were figuring out some knotty engineering problems. Yesterday the construction work growled with the noise of rotary pumps, the song of dusty negroes wheeling cement up plank tracks, and the low whistling of satisfied engineers. The unforeseen delays of cofferdam construction slowed work considerably and cost $10,000. Engineer Kloss remained optimistic: “I look for no further trouble. The people will doubtless be very agreeably surprised if they find it possible to use the bridge in November. Some bets have been made that the bridge will not be in use on January 1. . . . It is well to reflect, however, that the bridge is worth waiting for, no matter how long it takes to get it. By August of 1913, a labor force of one hundred men working twelve hour days and an average of three night shifts a week had completed most of the underwater work requiring cofferdams. The builders were now “almost certain” that the bridge would be finished by November 15, and were looking forward to the arrival of the Pennsylvania Steel Works crew, who were to install the metal lift and motors for the drawbridge. That summer, Tampa buzzed with building activity. New houses, new stores, and new public buildings all reflected the city’s prosperity. 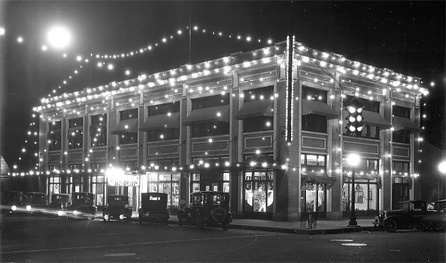 New electric streetlights lit the city’s preeminent shopping district along Franklin Street from Jackson to Harrison. 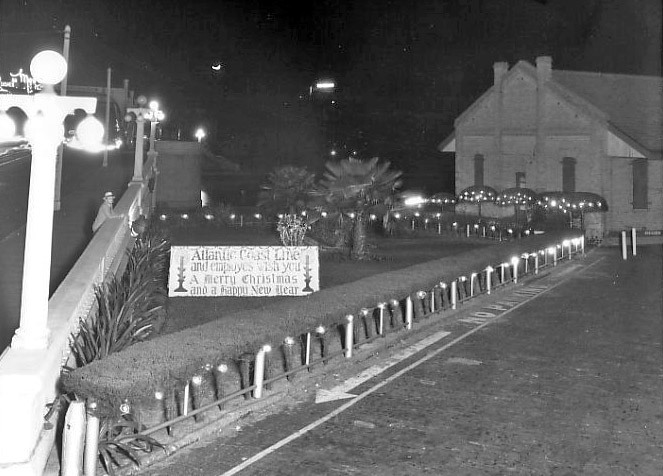 These lights were the first part of the electric company’s plan to give Tampa a “White Way” nearly a mile long, with the next step being to install electric lights on Lafayette Street from Florida Avenue across the bridge. 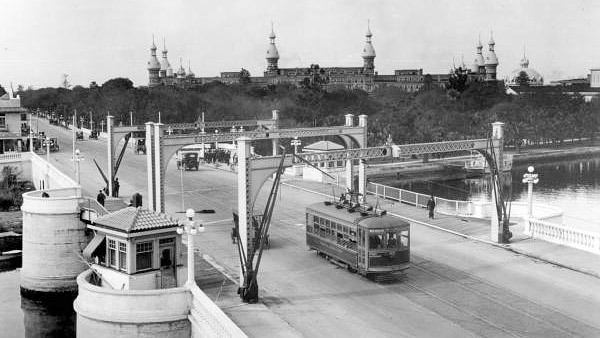 Tampa Electric Company had installed arc lights on the old Lafayette Street Bridge in January 1912, lighting the roadway and lighting under the draw to keep boats from hitting the bridge at nigh; however, these lights on the bridge were for safety and convenience rather than part of a White Way. Lights on the TECO office at 810 Tampa St. If one will go into Plant Park and squint out of the corner of one eye at the western approach of the new Lafayette street bridge, he will see looming white and magnificent, behind the trees and shrubbery, the west approach of the new Lafayette street bridge topped with ornamental balustrades, presenting an impression of a completed structure. Once the concrete work was finished, the city had the responsibility of filling and paving the approaches. Dirt from a one-mile-long sewer project along Cleveland Street in Hyde Park provided the fill for the west approach, while six teams hauled sand from Tampa Heights for the east approach. The city let a contract to cover the approaches with modern bitulithic paving over a concrete base. Hugh Macfarlane recommended using a temporary pavement of brick, giving the fill time to settle. Engineer Hodge expressed his opinion that the fill was already compact enough, based on what he saw when telephone poles were installed on the west approach. But Macfarlane was more concerned about the east approach, which was more recently filled and where lay the crumbled remains of the old bridge’s brick piers. Because of Macfarlane’s concerns, and despite the assurances of the engineers, the city initially used brick paving. The bricks were replaced with bitulithic paving the following spring. Macfarlane, never one to hold back an opinion, again raised an alarm when he noticed that the south wall of the east approach was nine inches lower than the north wall. City Engineer Neff confirmed this discrepancy. Consulting engineer Kloss admitted this was true, but added that it was intentional, to leave space for L.J. Jones to build a sidewalk between the bridge and his new building. 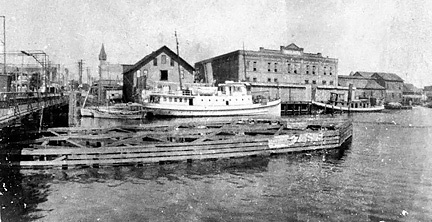 Jones’ fish business had been demolished to make way for the new bridge, and he was now planning to build a three-story brick building, with steamboat docks on the river, a railroad platform on Water Street, and a row of retail stores along Lafayette Street with plate glass windows shaded by copper marquees suspended by ornamental chains. His plan was to operate his wholesale fish company out of the building’s basement and a retail fish market on Lafayette Street, while renting the rest of the building to other businesses. establishment on the river on the south side of the 2nd Lafayette St. bridge. 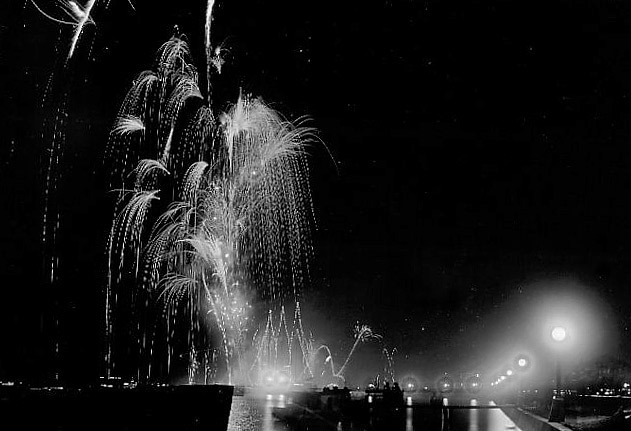 The Merchants Association began negotiations with the Pains Fire Works Display Company to provide illuminations along the river near the bridge and elaborate displays, with a pyrotechnic portrait of Mayor McKay and another of the destruction of Pompeii. Fire departments from Florida and Georgia were invited to participate in the parade, which was scheduled for December 17 and 18, coinciding with the Florida Fire Prevention Association meeting in Tampa. The planners hoped to have bands, athletic competitions, a water carnival, and an animated chess match, all intended to draw people to Tampa from other cities. The motivation of the merchants was clear and freely admitted – to attract people to Tampa who would buy things from their stores. A short time later, however, the boosters announced that no celebration would be held in December, due to conflicts with the holiday season. Instead, the formal bridge opening would be held in conjunction with the Gasparilla Festival to be held in February of the following year. The Merchants Association’s Booster Club worked with the Tampa Board of Trade and Ye Mystic Krewe, the organization overseeing Gasparilla, to organize the bridge’s opening ceremony. 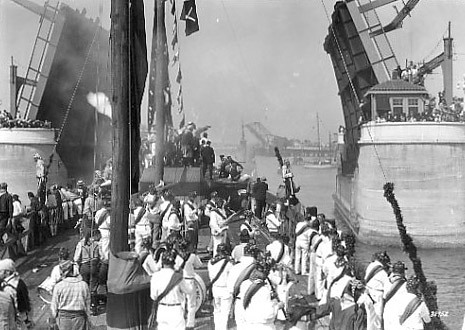 The purpose of the celebration was still to attract attention and visitors, but by shifting the formal bridge opening to Gasparilla, control was more strongly in the hands of the civic elite, rather than the city’s merchants. 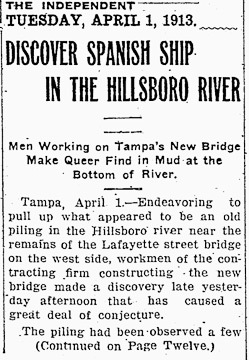 W. H. Hodge, of Boller, Hodge, & Baird, arrived in Tampa in mid-December to test the bridge. 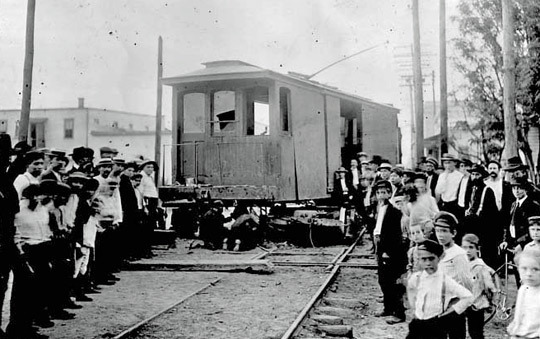 The engineer loaded two streetcars with 50,000 pounds each and two ten-ton steamrollers were sent across the draw at the same time. Hodge proclaimed, “She’s sound as a rock,” and the city opened the bridge. The plaque on the bridge tender's house. Hugh Macfarlane's name is misspelled. After trying out the trolley car, the dignitaries scrambled to ride the U.S. Government’s launch DeSoto, the first ship to pass under the new bridge. Captain Bie of the DeSoto had also been one of the favored streetcar passengers, representing the War Department. 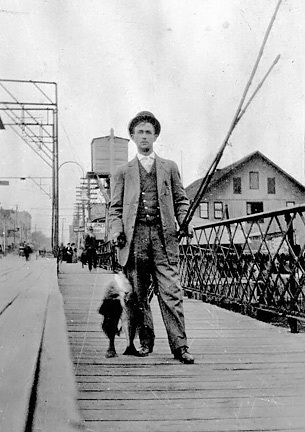 Hugh Macfarlane was the first to drive an automobile over the bridge, and Everett Snow rode the first motorcycle. 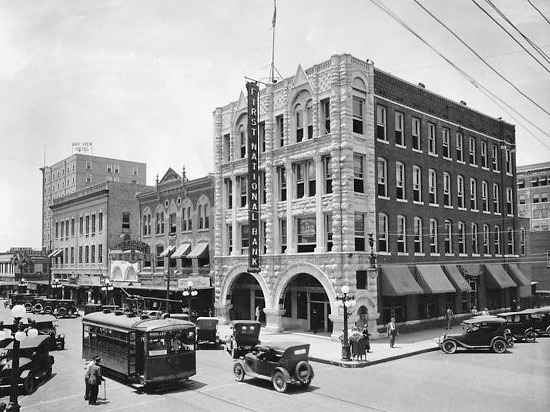 The Montgomery Amusement Company, which filmed weekly events in cities where the company owned theaters, recorded portions of the celebration, including the first car to cross and the raising of the bascule lifts. While we give vent to civic hurrahing over the new bridge, let us not forget the little structure that has served us while the new one was in course of construction. The temporary bridge, while crude, unstable and far from impressive in appearance, has served its purpose excellently. It was a public utility which was indispensable – we couldn’t have done without it. And kind fortune always hovered over it, for it is regarded as miraculous that in the crush of traffic upon it and approaching it, there were not many serious accidents. It has borne a charmed life and now that we are to consign it to the junk heap, we pay it this simple tribute of esteem and affection. Looking east along Lafayette St, 1913. 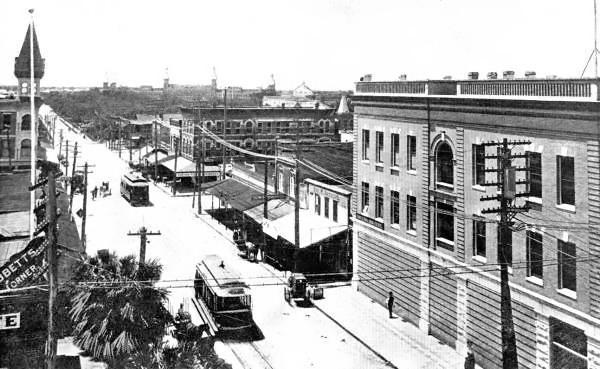 The first intersection is Tampa St., the next one where the streetcar is located is Franklin St.
1913 The day the new bridge opened to general traffic was the same day that the Tampa Electric Company opened its new office building to the public. The building gave people an excuse to walk over the bridge, or to ride the streetcars that were again crossing the river after a seventeen-month interruption. Tampa Electric’s new office displayed the latest wonders of electricity – cooking equipment and Christmas trees decorated with tiny colorful lights. While the masses promenaded, city officials, prominent citizens, and the bridge’s contractors and engineers feasted at Garcia’s restaurant. Amidst a cloud of cigar smoke, the diners gave short speeches, expressing satisfaction with the finished bridge. The engineers and other out-of-town workers were doubly happy, glad that after nearly a year and a half in Tampa, they could be home for Christmas. 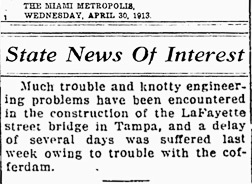 The Lafayette Street Bridge was but one public reminder of the power held by the business elite of Tampa. Tampa’s Gasparilla festival, which had started a few years earlier, was another. 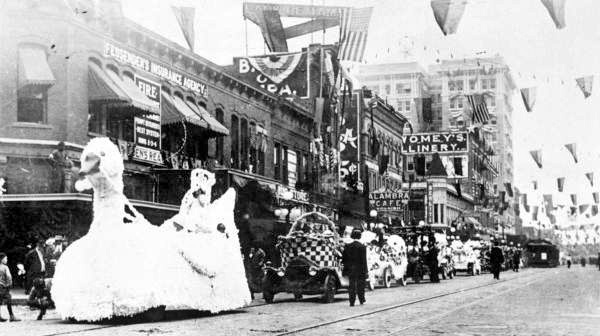 In 1904, Mary Louise Dodge, social editor for the Tampa Tribune, wanted to enlarge the city’s May Day Festival into a three to four day statewide event. At the suggestion of George Hardee, she secretly planned to have a “pirate krewe” take the city as part of the festival. For the first several years, Gasparilla planners deliberately scheduled the event to coincide with other civic celebrations, whether the state fair in 1905, the Panama Canal Celebration in 1910, or George Washington’s Birthday in 1912. 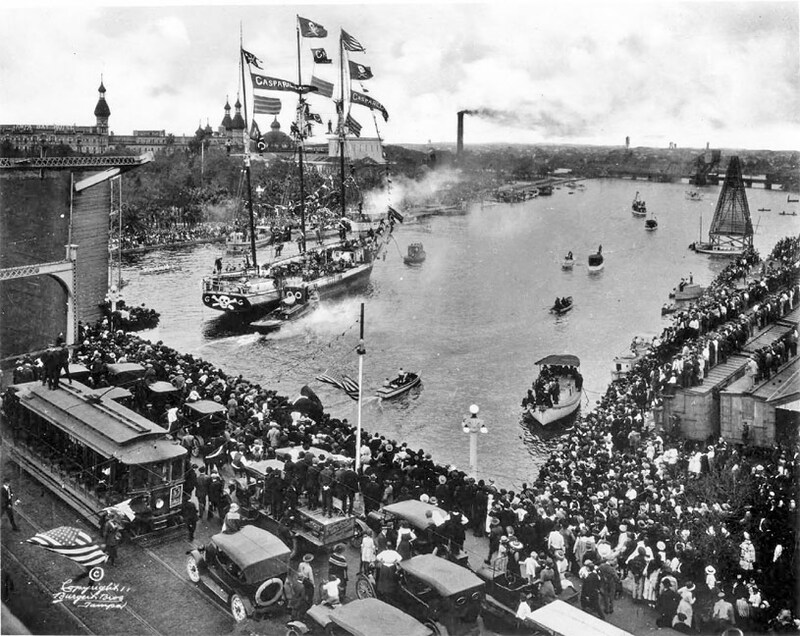 By 1913, Gasparilla was enough of its own occasion to draw a crowd, and in 1914, the festival was a celebration of Tampa’s place in the Industrial Age. In addition to the bridge’s dedication, the official 1914 program included a massive release of homing pigeons, a children’s floral parade, a human chess game, an historic pageant depicting The Landing of DeSoto, fireworks, Sunday sermons, a major league baseball game, and a nighttime carnival on Franklin Street with its electric streetlights. 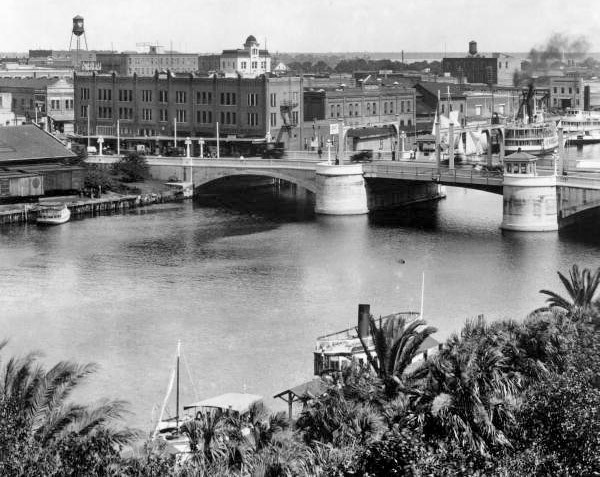 The phenomenon of electricity fascinated Tampa, and the new electrically operated drawbridge spanning the Hillsborough River was a source of pride for the city’s boosters. 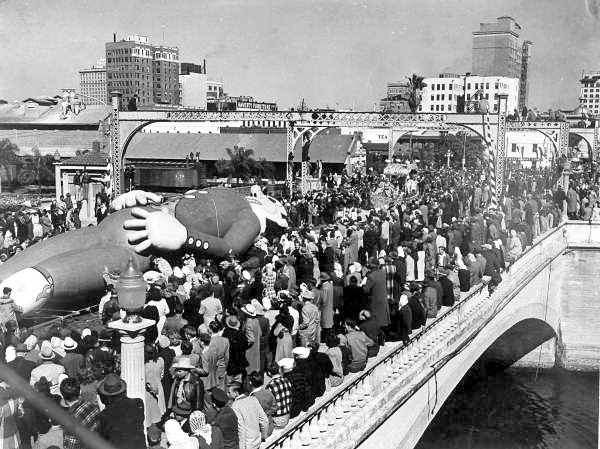 In the Gasparilla parade that year, Tampa Electric Company’s float garnered the most attention from parade goers, featuring a working model of the drawbridge, praised as a model of accuracy. 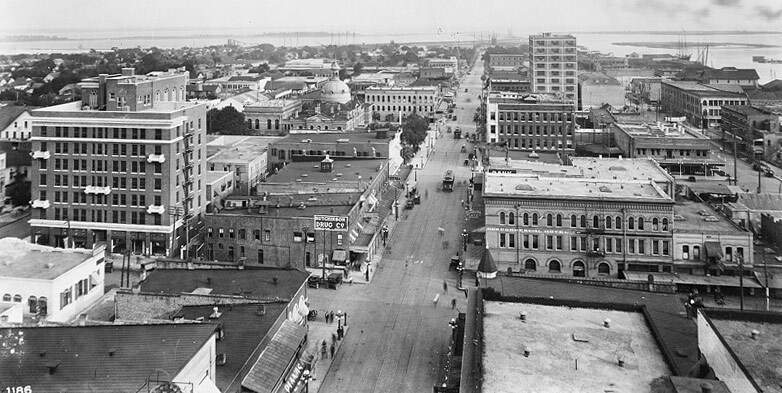 Other city improvement projects started or completed at about the same time were the seawall along Bayshore Boulevard, a new city hall building, a new sewer system (completed 1915), and Tampa Union Station. 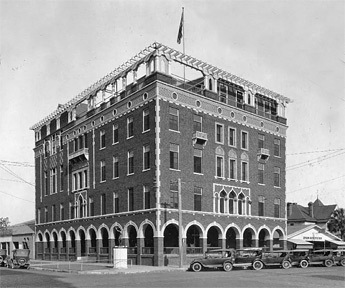 Tampa’s first skyscraper, the eight-story Hillsboro Hotel, was built in 1912, followed in 1913 by a new Elks Lodge and the Knights of Pythias Building, both of which were ten stories tall. 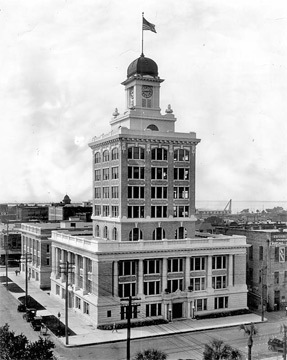 The local phone company, Peninsular Telephone, built a new four-story building in 1914 and in 1915 replaced their old “common battery” system with new, automatic telephones. 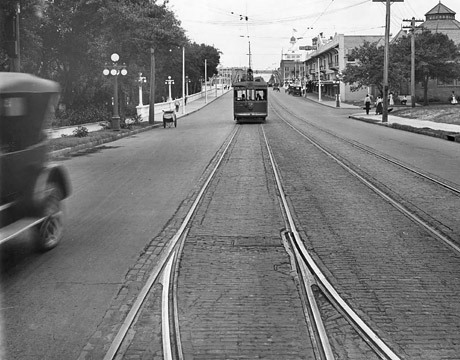 In 1913, Tampa’s streetcar lines were unified under the ownership of Tampa Electric Company, for a total of forty-seven miles of tracks over which sixty-seven trolley cars rolled. 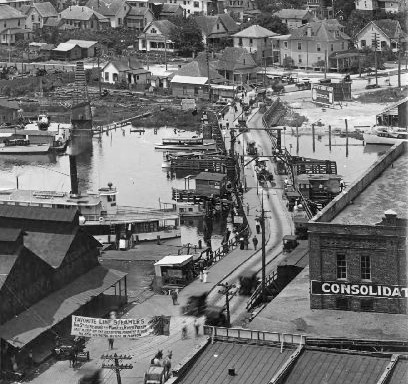 In 1914, the first direct railroad connection opened between Tampa and St. Petersburg, and work started on transforming the Ybor Estuary into the Ybor Channel. 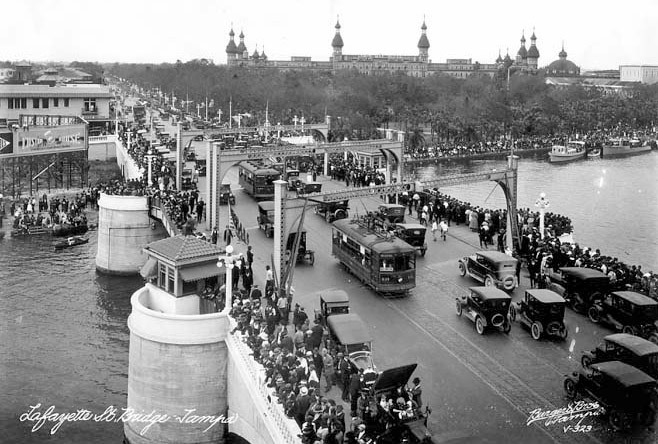 And on January 1, 1914, Tampans crowded onto the Lafayette Street Bridge and along the Hillsborough River, to watch as Tony Jannus landed his airplane, with Abram Pheil, St. Pete Mayor, as his passenger, at the foot of Lee Street. The first regularly schedule airline service in the world had begun. The bridge builders of the nineteenth century could not have foreseen the scale of automotive traffic in the twentieth century. 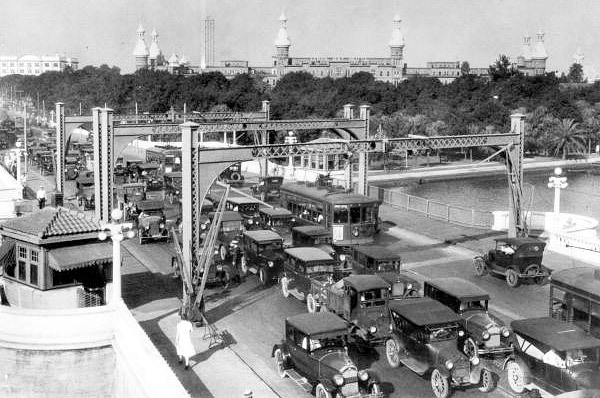 In 1913, there were 1,500 cars in Tampa, and the city’s business leaders tended to be the city’s automobile owners. Where once cattle plodded across the bridge regularly (although this was forbidden between 9 P.M. and 5 A.M.), now locals drove Model T’s. Eyebrows rose at the sight of an ox-drawn cart crossing the bridge. Gone were the days of paying the ferry man ten cents to take your cow across the river. The structure in the river at upper right is a bat tower.